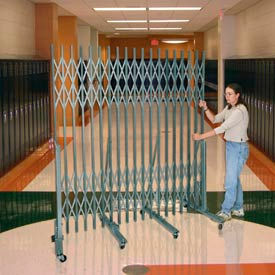 Folding Security Gate Quickly And Easily Blocks Access To Dangerous Or Restricted Areas. Safety barricade gate weighs a generous 154 lbs. and is made using all steel with a yellow powder coat finish. 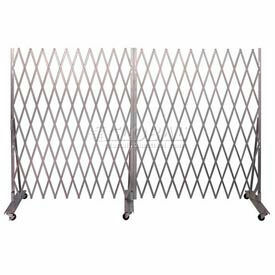 Folding security gate expands to 20'L x 52-1/2"H and folds to a compact 23-1/2"L x 24"W x 64"H. The safety gate includes a chain to join gate to wall for secure positioning. Security door gate is easy to move using 6 heavy duty casters, 2 swivel and 4 with brakes for locking position. Includes an English/Spanish bi-lingual warning sign that reads Stop for your safety. This aisle has been temporarily closed. 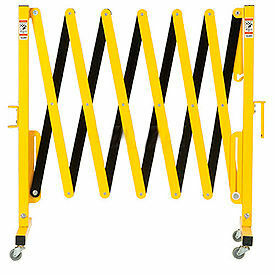 Portable Pedestrian Safety Gates Create A Barricade Anywhere You Need In Seconds. 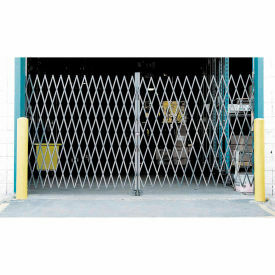 These barricade gates feature interlocking ends that can be connected to join multiple security gates and form longer runs. 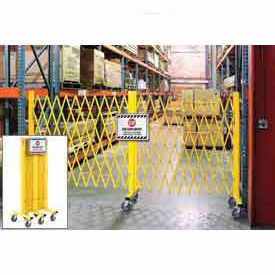 Safety barricade gates measure 37 H when folded and feature yellow and black slats. Aluminum Pedestrian Gate weighs only 31 lbs. and expands from 14-1/5" to 144 L. Steel Security Gates have a durable steel construction and weigh 46 lbs. 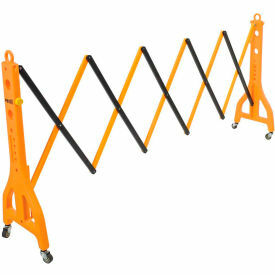 Expands from 16" to 141"L. Barricades with Casters include 4 swivel casters for easy mobility. Portable Plastic Pedestrian Barricade Gates Are Lightweight And Unfold In Seconds To Create Barricades. Portable Plastic Pedestrian Barricade Gates are made of plastic for superior rust, di-electric and heat resistance. Barricades expand and close easily for quick set up and compact storage. Interlocking ends can be connected to join multiple security gates and form longer runs. Available styles include Fill Chamber, Barricade w/Delineator Slots/Fill Chamber and Delineator Slots only. Styles available with casters or without casters. Expanded lengths are 90", 122" and 139". Folded lengths vary per model. Available colors are Yellow/Black and Orange/White. Expandable Security Gates Offer Add-On Attachments That Extend The Overall Width To Provide Efficient Security For Large, Extra Wide Areas. Folding security gates are made of galvanized steel for corrosion resistance. Steel rivets on 14 gauge steel web gates allow easy folding and expanding. Gates provide a coverage area of up to 12L when open, and closes to only 27"L, using two 6L webbing sections. 12 gauge angled steel axle posts are 1-1/2 x 1-1/2 and reinforced for extra strength. Gates include three 28 D axles that offer 4 sweep clearance. Axle posts on each end include a locking bar and padlockable hasp (lock sold separately) to secure gates in folded position. Moves easily on six 3 rubber casters. Add-On Gates include one axle post with 2 casters and a mounting post that easily attaches to end posts. Folding Security Gates are made with strong 3/4" 14 gauge channel steel. Security Gates have an exclusive non-interference design that preserves the integrity of durable gray powder coat finish for a longer life. Zinc-plated rivets help prevent corrosion. Dock Door Security Gates come complete with smooth rolling wheels and a padlock lug (lock sold separately). Safety Gates Fold Complete and Swing up to 180 degrees for an Unobstructed Clear Opening. Loading Dock Gates can be either recess or surface mounted and allow for easy installation (hardware for mounting to wood, steel or concrete walls is included). Double Folding Security Gates have a cane bolt that holds the left half in position, or both halves may be opened for full access.